In last week’s Monday Mingle I told you about my “BOLD” Goal in 2013 to run 12 5k races and have a quilt made in December of all 12 shirts. 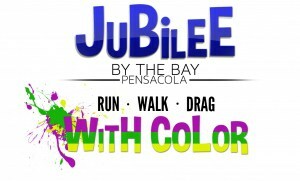 Last weekend I completed Goal #1 when I participated in the Jubilee Run With Color in Downtown Pensacola. First of all, if you have never been to a Color Run, you absolutely need to. Even if you are not a “runner.” They are really just that much fun. With this particular color run there was no official time, no prizes for first place (that I am aware of) besides maybe bragging rights, and no one getting all spastic over if the course really was 3.1 miles long. What there was though was 3,000+ fun loving folks dressed up in all kinds of fabulous white costumes “getting their color on” throughout Downtown Pensacola and Maritime Park. The morning began…. at 43*. I was not thrilled. Two pairs of socks, leggings, sweatpants, three shirts and a pair of gloves later… I was ready to roll. We met up with the rest of the crew and headed downtown. I think it was up to about 46* by this time. A “heat wave” for some, but a miserable predicament for this Florida girl. I was seriously worried I was going to freeze to death. Or that my lungs were going to turn in to color coated frozen raisins trying to run and breathe with it that cold. Thankfully only part of this came true. Yes, that is a wheelchair. 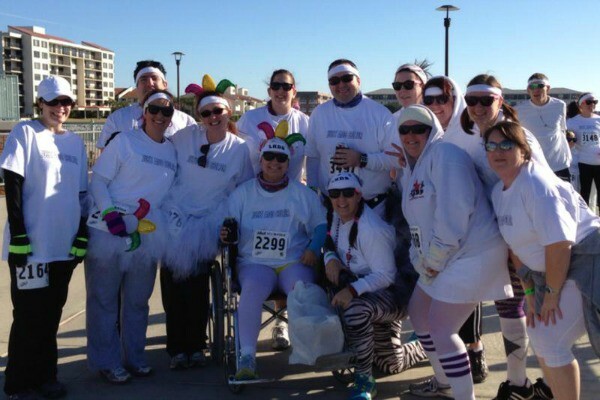 Elizabeth decided to break her leg on NYE when we were all already registered for the run. A few web searches and phone calls later, we got the OK to push her through the run. It worked out so well though we may do this every time – just have her keep putting the boot on and letting us push her. Next time however we will be equipping the chair with a cooler. The “run” – if you can even call it that – went great. There were three color stations set up – purple, yellow, and green for Mardi Gras – with dozens of volunteers throwing handfuls, buckets, and shovels of color into the air and onto the runners. My goal of getting through in less than an hour was completely derailed when I realized at the first color station that there was no point in caring about the time. It was much more fun to play around and dance in the clouds of colored dust… and that is exactly what we did. After the Run we rehydrated with Bloody Marys – what!?! it has vegetable juice! – and danced on the lawn of the Maritime Park in all of our colored up glory. Then we stripped down and raced home to get on the road to Atlanta for the NFC Championship game. I was not near as cold as I feared I would be, but I was super glad I had layered up. The funny thing was somehow color managed to get all the way through all three layers of clothing to stain my skin in random places. Not real sure how that happened. And my pretty pink shoes… yeah, they are kinda purple now. It has been 3 days since the run and I have washed my hair four times…. but I still have a green scalp and one ear is still a bit of a purple hue. And I totally do not care. It was the perfect way to kick off 2013 in a BOLD, fun way, and we are looking forward to Race #2 – the Dirty Girl Mud Run in Mobile on February 16th. HOW FUN!!! I am doing the Graffiti Run (well, walk, for me) this Sunday! I am even more pumped after reading this! that’s awesome! They are SO much FUN!!! I have never done a color run but it sounds like a lot of fun! First I have to say I love your goal! What a brilliant, fun, and inspiring idea! This color run sounds and looks so fun! I’d love to do one this year and have heard they are fun for the whole family so I’d love to take the kids along too if we can. Sounds awesome! I did the muddy run and I loved it! I already have one 5k scheduled for the year: the foam run. Good for you! I think your goal is awesome! I did one last month. It was super fun! How fun!! I’ve never heard of anything like that before. I haven’t done one but I really wanted to do the Color Run here in Sacramento last year when it was here. I will definitely signup if it comes back my way. 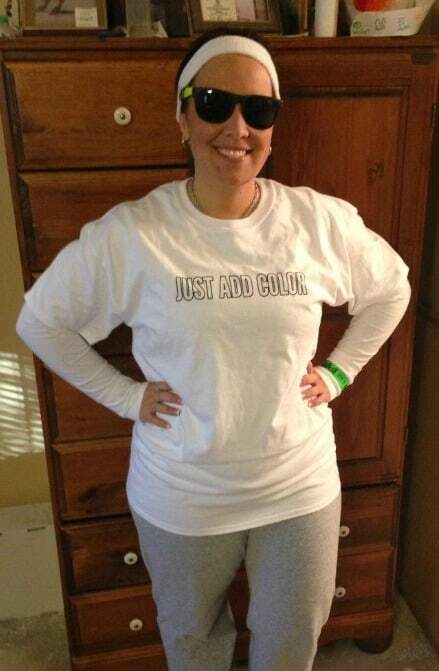 I was just looking at a color run this morning online – the rad run. I was curious as to what that stuff actually is that they color everyone with. It’s cornstarch! yes – and it gets EVERYWHERE lol sooo fun! I cant wait to do another one! This look like you had such an amazing time! I really want to do the color run this year when it comes back to Northern California. 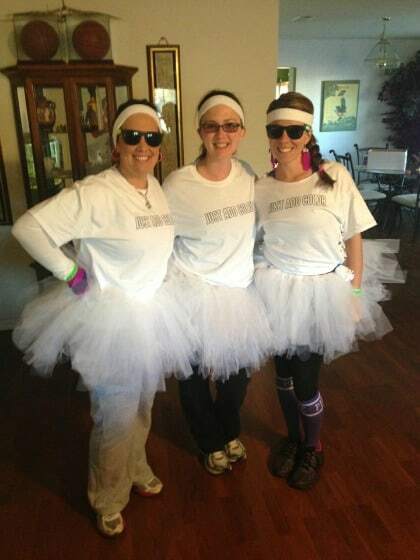 I love your tutus. Sometimes it’s just great to be able to set yourself free and dance in the rainbows. it was so great to not care one bit about time or pace or anything… we just had fun. It was fantastic! You should TOTALLY do it – you will have a blast. Would love to try it out! Can’t think of a funner way to get back into running. I am planning on going this year. I think there is one in August in Birmingham. I couldnt go last time because I was doing the Graco Event at my Babies R Us. Saw you on Facebook and you had me at Moscato! 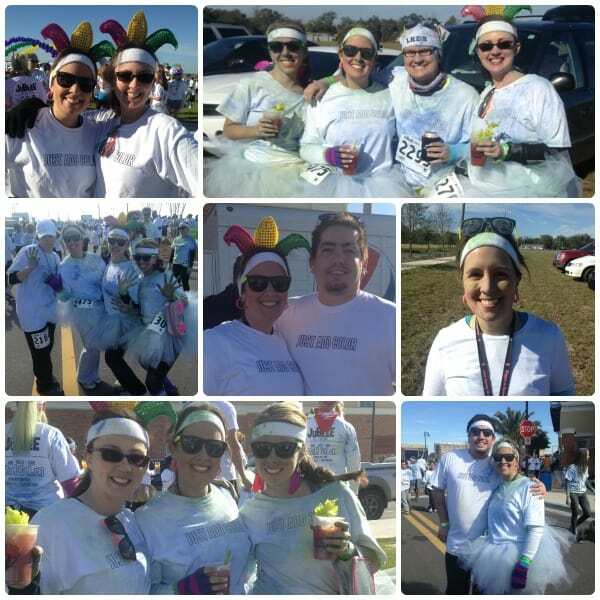 We just did the Tempe Color Run two weeks ago…in the pouring rain! But it was so much fun and we’ve vowed to do it every year!